I’m not exactly sure why I decided to make my Yum Yum Sauce with Chipotle, but man, am I glad I did. It was really just the thing. I guess it’s really like Chipotle Mayo with a bit more sophistication. Oh my gosh is it good! On the other hand, if Chipotle doesn’t float your boat, and you want to go the traditional route, just use a tomato paste instead of the Chipotle. Feel free to riff off this as much as you want. Maybe a touch of smoked paprika? Or swing back to the Asian side with a few drops of Sesame oil. 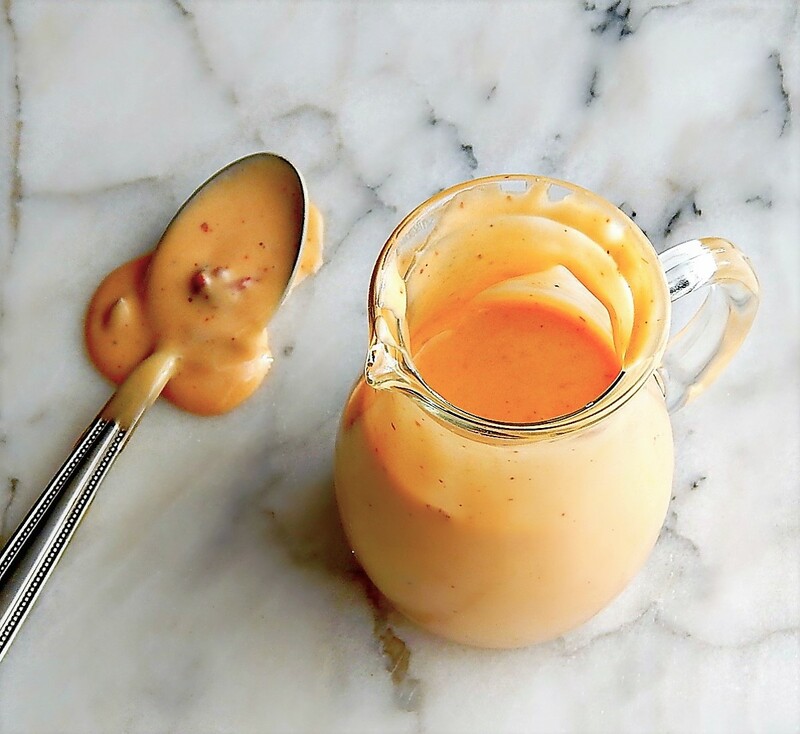 If you’ve never had Yum Yum Sauce, it’s a little tangy with just a hint of spice and it’s pretty amazing stuff. You might have had it at your Japanese Steak House. Use it as a dip for veggies or tempura, slather it on sandwiches. Put it on your Avocado Toast. You’re getting tired of that already, aren’t you? It would be great on burgers, in a grilled cheese. French Fries? Did I mention French Fries? But most of all use it in my Steak Ramen Bowls with Chipotle Yum Yum Sauce. Enjoy! Note: feel free to adjust any and all ingredients to your taste. If you’re not a fan of heat, use tomato paste instead of chipotle for a more traditional sauce. Mix all the ingredients together. It will thicken a bit when refrigerated. Make it a little ahead if time allows so the flavors blend. I’ll be sharing this recipe at Fiesta Friday #211, hosted this week by Diann @ Of Goats and Greens and Antonia @ Zoale.com. This entry was posted in Click here for Fabulous Food Posts and tagged Asian, Chipotle, Condiments, Mayonnaise. Bookmark the permalink. I need to find chipotle pepper in adobo sauce!!! This is so delicious, Mollie!! I use chipotle in adobo so much I could never live w/o it. There are recipes, but then you’d need the jalapenos, and they might be hard to find? Anyway this was such a fun sauce, Jhuls. I found jalapeños before, maybe I’d find chipotle in adobo sauce, too! Let’s not lose hope.😂 Thanks, Mollie! Thanks for sharing with Fiesta Friday! Sorry for the late reply! And thanks for hosting us! Yum Yum sauce is delicious <3 I have never thought to make a chipotle version! I really do like the chipotle version, though! I can think of soo many uses for this already!! Thanks for sharing! Thanks. It’s a fun lttle sauce. I could totally see putting this on all the things! <3 Chipotle yum yum, here I come! I need to try this for the husband. He likes spicy! Me not so much – spicy that is. Hi Miss Judy, just put a little chipotle in it and you should both like it! 🙂 It’s not super hot, though. Okay. I will try it. Hi Laura, and thanks! I’m craving sweet potato fries now because I think they’d be a great combo! And why on earth would you NOT use chipotles in chipotle yum yum sauce??? LOL. Looks like great stuff to have on hand for all kinds of food! I put some on some chicken nachos last night and loved them! I think I’ll make this next time with yogurt for a healthier version! Oh, I love bang bang shrimp but never had bang bang chicken! How fun! Thanks and it’s such a fun sauce! It will just transform about anything it’s on.